We arrived in the city during peak rush hour and soon realized that Varanasi wasn’t going to let us into its heart quite so easily—we’d have to work for it. For the next two hours we sat among a few thousand others cars, taxis, rickshaws, and bicycles on a pitch dark and dirty road. Much of the road was flooded in a mysterious sludge-like liquid and all around us—despite the standstill traffic—a symphony of horns screamed like a million locusts in the night. I rolled up my window and turned up the radio. Time crept slowly by and we crawled through the city at a glacier’s pace. How on earth we ended up next to them on some random Varanasi surface street in a city of 1.1 million was beside me, but I found great comfort in knowing there were two other crazies doing the same stupid thing as us. Misery does love company. It turned out they had indeed arrived hours before us but their GPS had led them on a wild goose chase through the city, placing them squarely back where they had begun. Together, we slowly crept forward toward our destination. The hotel that we fought so desperately to find turned out to be a fail. The hotel wanted to charge us the price of a rather costly room to park in their parking lot, so Regina and Brad put on their problem-solving hats and set off on foot down the street in search of a new location. David and I watched the vans, and as idle foreigners we made for a captive audience to a rickshaw driver who discussed repeatedly the benefits of using him as our private Varanasi rickshaw driver. A half an hour later two silhouettes reappeared. Regina and Brad had found a place—The Hotel de Paris, a former colonial palace turned chic hotel built during the British era. “How are the rooms?” I asked. “Oh just wait and see,” Brad replied. We drove through the hotel’s iron gates and circled around its beautifully manicured lawn, stopping alongside the hotel’s veranda where we popped our top and opened the sliding door. 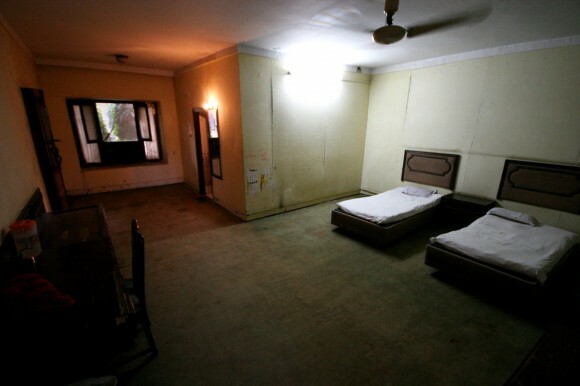 Our hotel room was surprisingly spacious, with the walls colored in a delicate layer of mold and with carpet that had been transformed into a damp and moldy sponge from decades of dirt and moisture caked into its fibers. The last time this place was cleaned was clearly by British palace maids sometime in the 1940’s. Regina ventured into the bathroom to test the shower. She promptly left the room with a discouraged look on her face and returned with the hotel manager. “The shower, it doesn’t even work!” she yelled in surprise. She turned on the water and it trickled out from the shower head one droplet at a time. The manager wanted to provide us a proper service so he unscrewed another showerhead from a neighboring room and replaced ours with a slightly less calcified one. With no shower curtain and no drainage point on the floor one shower was all it took to turn the entire bathroom into a sloshing pool of dirty water. But a miracle happened that night, and in just a few hours the pool of water had conveniently disappeared into the cracks of the hotel’s foundation. Not one of us was too bothered by our circumstances. In fact, we all felt like we were in paradise. We were clean, in a private gated area, and done driving for at least two days. We gathered on the veranda wall next to our mobile housing units, drank a few beers, and slept away the nightmares from the last few days. 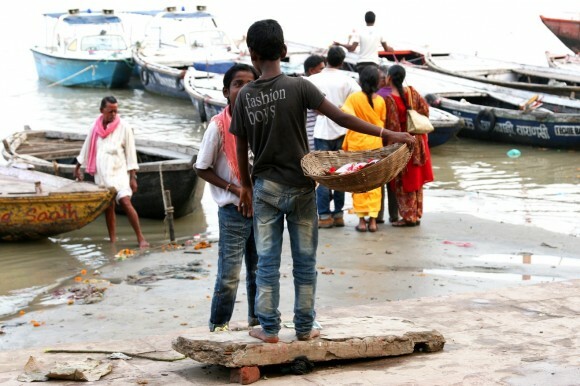 Varanasi shocked me, even after being in India for a month. 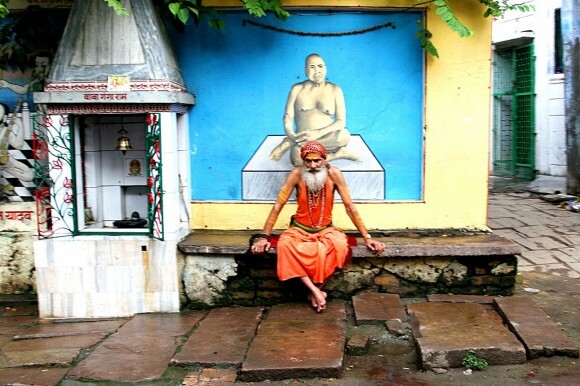 It’s one of the oldest, most continually inhabited cities in the world (and the oldest in India) and one of Hinduism’s most holy pilgrimage sites. 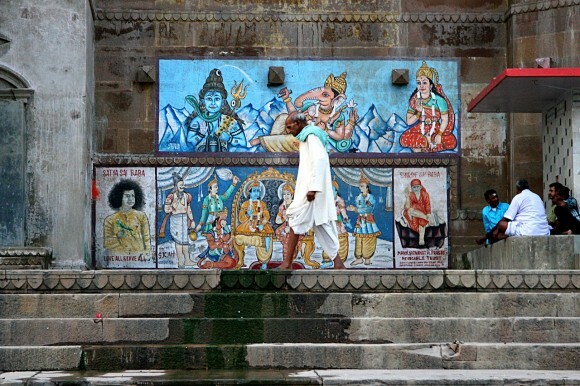 The city is especially holy in Hindu mythology as the place where Lord Shiva stood when time began, and because of its location next to Ganges, Hinduism’s holiest river. Thousands of pilgrims arrive daily to bathe in the holy water of the Ganges, and scores of people make the pilgrimage to Varanasi to die. 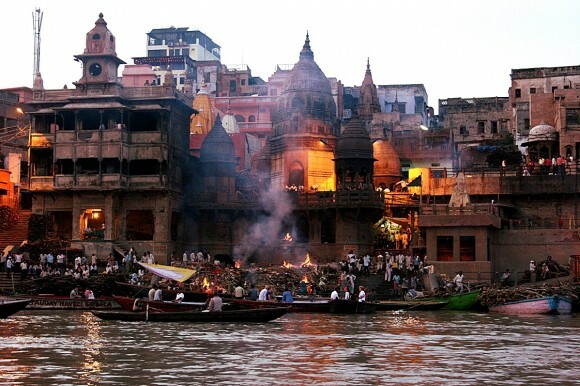 To the non-Hindu it may seem morose, but dying in Varanasi and being cremated by the flames of the eternal fire allows one’s soul to ascend straight to nirvana, and finally break free of the eternal cycle of birth and death. In the morning we flagged down a rickshaw and headed to the ghats. 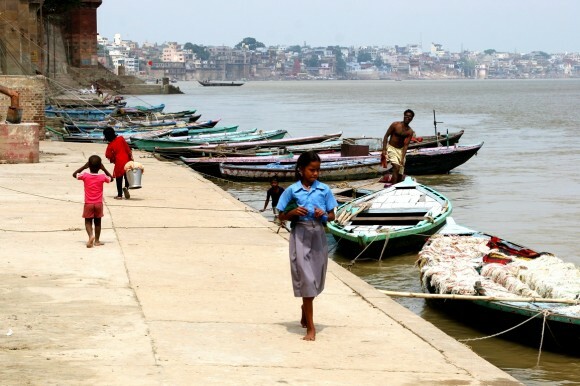 It turns out we had arrived in Varanasi just a week after the waters had subsided from the city’s worst flooding in 10 years. 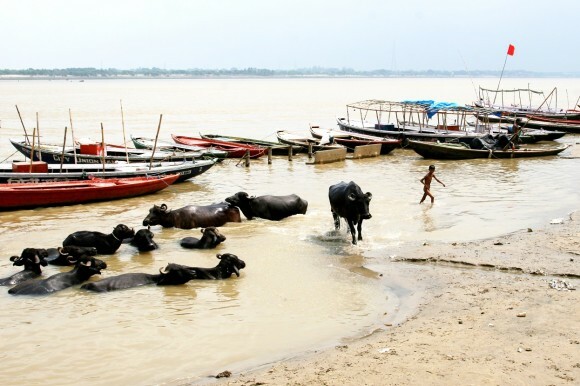 The Ganges River had risen for many days and when it settled back down the city’s ghats were covered in a solid mountain of mud. 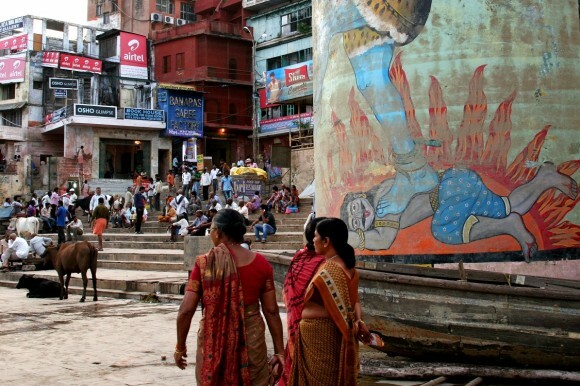 The steep steps that rose from the water’s banks were vital in everyday life, a public place where people bathed, washed their clothes, performed religious rituals, and burned their dead. 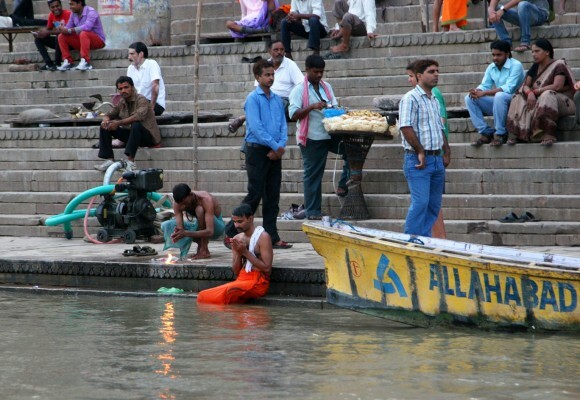 It was also a major tourist destination, and without ghats many people were cancelling their trips to Varanasi. 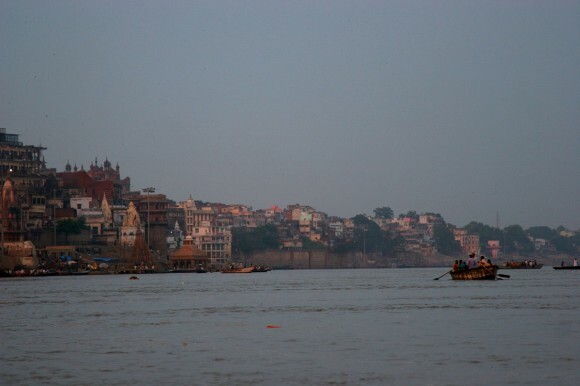 The removal of the mud deposits would be a monstrous task, and cleanup crews decided that the best method of clearing the muck from the ghats was to spray it back into the water with giant hoses. 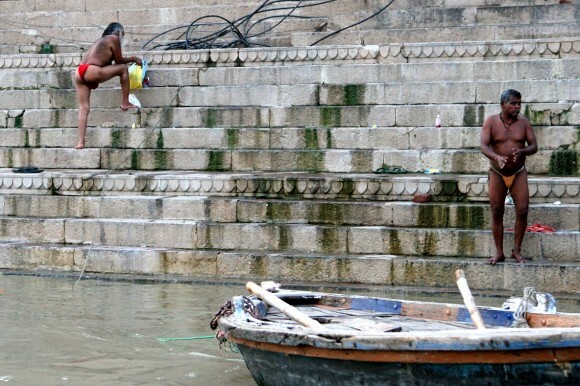 Despite the cleanup, the ghats were teeming with locals washing their clothes and pilgrims bathing in the water. At the top of the steps a group of Hindus were getting their hair shaved—a symbol of surrender and humility which is the first ritual performed when a pilgrim reaches their holy site. We continued walking along the ghats. 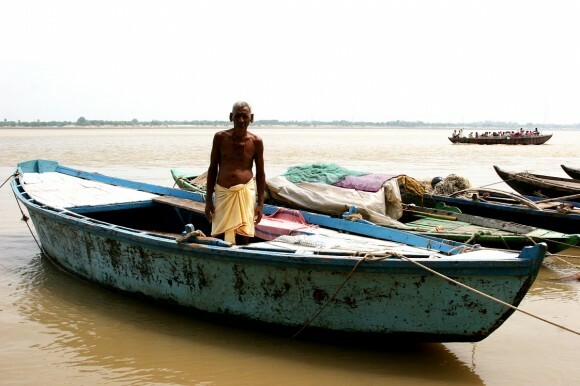 Boats full of pilgrims floated by, cows and goats rested on the steps, and fishermen stood in their idle boats. 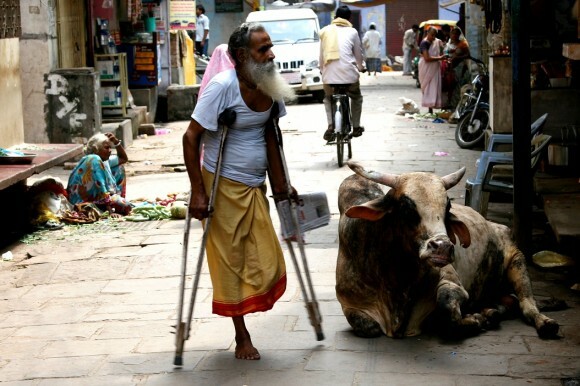 A naked boy herded his water buffalo out of the Ganges and spiritual men walked to and from their temples. We approached one captivating man who let his shawl blow in the wind as he wandered down the waterfront. He didn’t speak a word during our exchange but a friendly local washing clothes nearby introduced us to him. 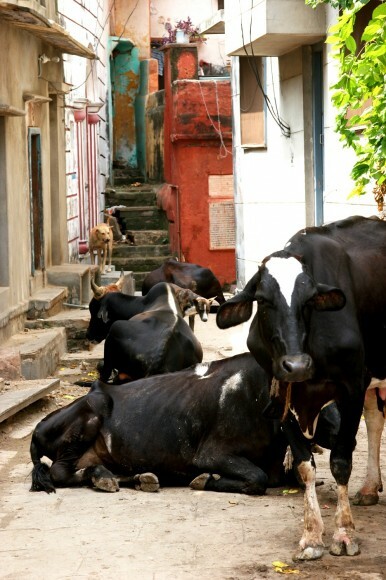 The back alleys of Varanasi’s old town were just as interesting as the ghats. They were packed with people, both foreigners and Indian tourists. Women scoured the sari shops looking at various prints and wandered in and out of specialty stores to buy bangles and stick-on bindis for their foreheads. The alleys were so narrow that small shops operated in cubby holes cut in the walls. They were so small that the shopkeepers couldn’t even stand inside; instead they’d climb inside their cubby hole and sit there for the remainder of the day. Eventually we made it out to the main street where bicycle rickshaw drivers painstakingly pedaled their customers around. 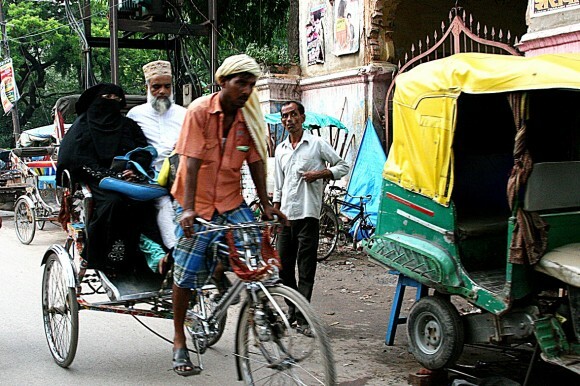 The heat and hard work of pedaling customers around seemed especially hard on the elderly bicycle rickshaw operators. The city was crazy and it made my head spin from its ceaseless activity. 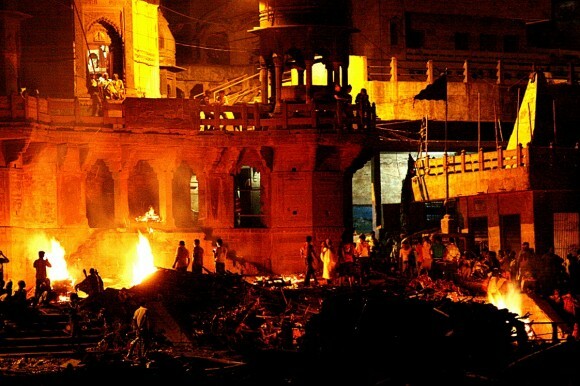 Most shocking to my western eyes was the spectacle of the Manikarnika ghat, better known as the “Burning Ghat,” where the deceased are brought to be publically cremated. I felt a bit nervous about the whole thing, first because I had never seen a burning body before and second because the ritual seemed so incredibly personal. As we got closer to the burning ghat the alley opened up into a warehouse of six foot tall stacked mounds of wood and from around a corner a young child appeared to warn us “No photos! No photos!” We were led up a set of winding stairs to a “hospice” that provided a viewing platform of the ghat below. Beneath us the smoke billowed from ten smoldering funeral pyres, stinging our eyes. Bodies wrapped in red cloth were sandwiched between two layers of wood and set ablaze. The fires were tended by Doms, the lowest caste in Hindu society, and the only sub-caste permitted to prepare the funeral pyre and dispose of the ashes and bone. The burning pyres were all at different stages; some just looked like piles of ash while others still contained the human form; several had been newly lit and the bodies were clearly visible as they became slowly consumed by the fire. We stood captivated. A Dom poked one of the bodies below to keep the fire stoked. I turned away for the umpteenth time as smoke seeped into my eyes. It was like a smoky campfire times ten. This ritual is only for men, first because females are weak and may cry during the ceremony—and this may prevent the soul from reaching nirvana—and second, because in the past women used to throw themselves into the fire when their husbands died. As I was told, when a person dies their body is wrapped in fabric and covered in flowers, and then carried on a wooden stretcher by the men of the family to the ghat. 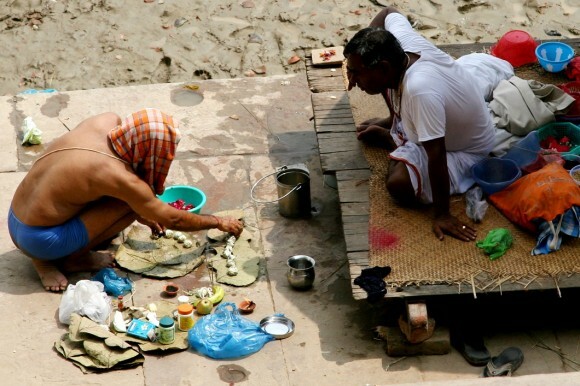 Once there the body receives a holy bath in the Ganges and is then carried to the pyres to await an open cremation spot. Next each family negotiates a price for the usage of the eternal fire, which is said to have been burning non-stop for the last 2,500 years. During times of flooding, like the one that just occurred, the fire is moved to higher ground. Once a family has negotiated usage of the fire, wood is procured. 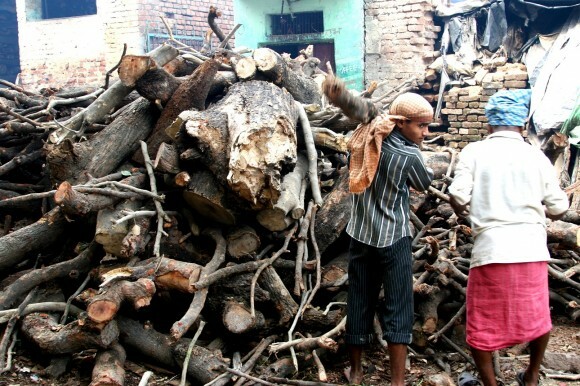 Different types of wood can be purchased, all varying in price, the cheapest being 150 rupees per kilogram. Typically 300 kilograms of wood are needed, producing a grand total of at least $1000 in wood expenses per cremation. Multiple cremations take place simultaneously, 24 hours per day, 365 days per year. About 300 bodies are burned here every day. 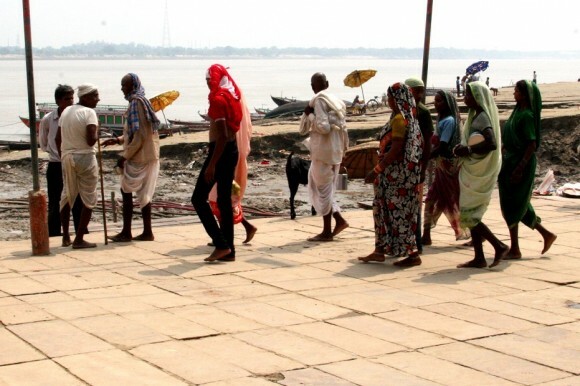 The stream of pilgrims coming to Varanasi to die is relentless. We watched below as a family approached an open pyre. The men placed their deceased family member over a pyre and then sprinkled the body in syrup of natural oils. Hindu custom dictates that the eldest son or the husband of the deceased is responsible for starting the fire, so from within the group an old frail man moved forward—it must have been his wife on the pyre. He was held upright by the men around him and passed a glowing torch which his sons helped to secure in his hands. His duty was expected now. As he reached forward and touched the torch to the wood his body became limp and he fell backward. He was caught in an instant, and within seconds lifted like a feather off the ground and carried away. 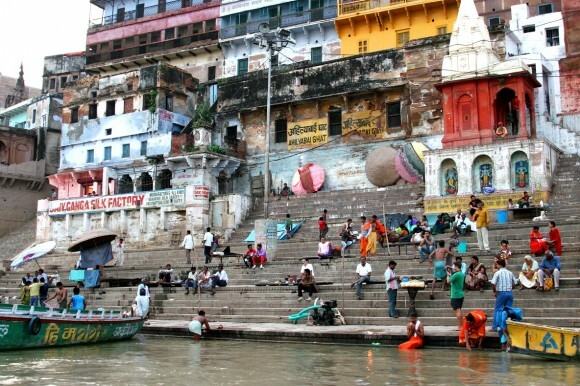 Nearby a group of bald white robed men sat motionless on the ghat’s steps. They were waiting for their loved ones’ cremations to end, a process that would take between two to three hours depending on a person’s size. What would remain after would be ash and either a pelvic bone, for a female, or the collarbone, for a man—both of which are said to be too dense to burn completely to ash. From here the family would sprinkle the remaining bones and ash in the Ganges River and the body would be washed away forever. We stood motionless still taking in what was going on down below. Men stood waist deep in the river amidst the piles of ash that floated on the river’s surface. They made their living here, panning through the ashes at the bottom of the river in search of gold fillings and gems to sell. Alongside the men were water buffalo who also didn’t mind the film of ash that surrounded them; they were just happy to be hidden from Varanasi’s unrelenting sun. 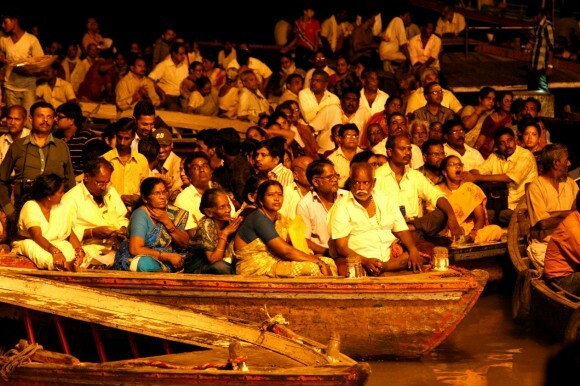 In the evening we met up with Regina and David for a boat ride on the Ganges. 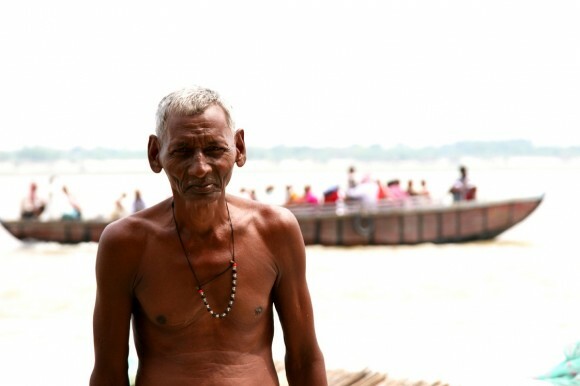 Our boat rower had been born and bred in Varanasi, and because of this he had a plethora of knowledge about the city’s historical buildings and cultural ways. 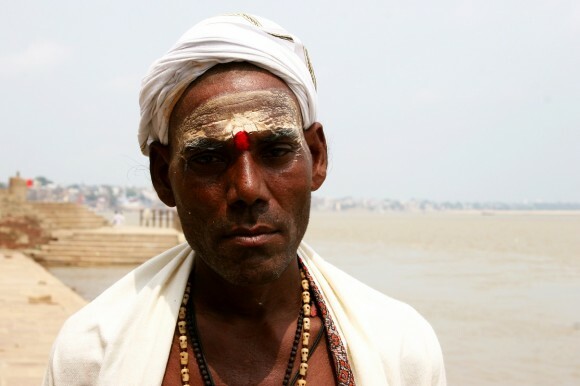 He rowed us up and down the shore where we saw the city from a different perspective, taking us to the burning ghats where we were allowed to take photos from afar, and finally to the Dashashwamedh Ghat where a nightly Ganga Aarti was commencing. At the Ganga Aarti , hundreds of Hindu devotees and a spattering of tourists squeezed into a sea of boats surrounding the water’s edge. 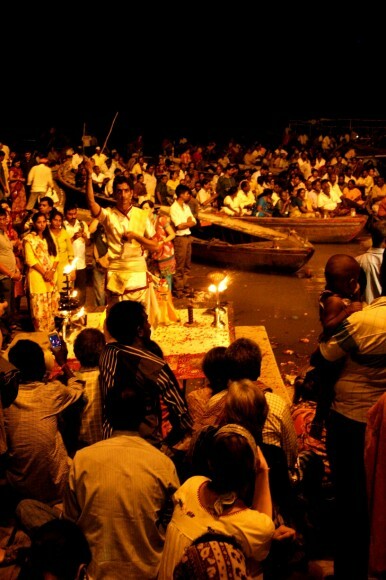 On the steps of the ghat a few hundred more people encircled the ceremony taking place. In the center a row of saffron robed men performed a choreographed ritual, blowing their conch shells and waving their incense and flaming brass lamps in the air. After a long and exhausting day the four of us squeezed our bodies into the back of a rickshaw and headed back to the chic Hotel de Paris. On the way back we noticed a group of men marching down the potholed road carrying a wooden stretcher. On top a body was wrapped in orange fabric. Sweat rolled down their foreheads but they didn’t seem to mind. 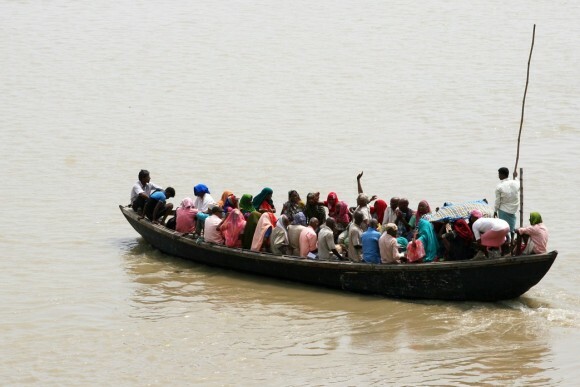 They were focused and determined to deliver their loved one to the Ganges River. I do so look forward to your blog every day. 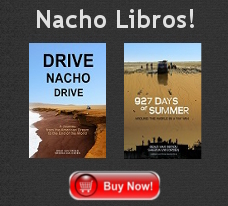 Thanks for writing so well that i feel like I am on the trip with you! @Pat, I don’t think you even understand just how convenient it is. 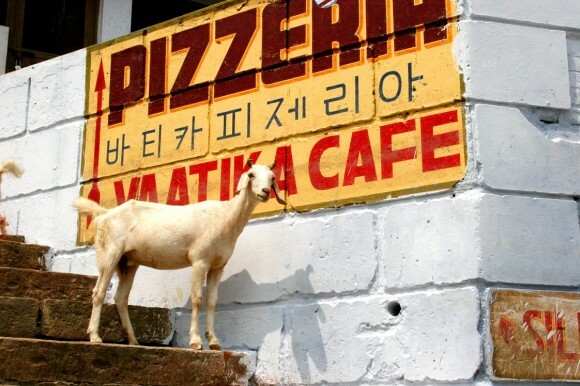 You don’t even need to make a reservation! Just show up! Although we didn’t make it to Varnasi, your photos bring back such intense memories of our three months in that chaotic, amazing, exasperating country. The ceaseless activity at all times of the day and night was often what amazed me the most. We did see a procession and pyre fire in Pushkar and it is something we’ll never forget. 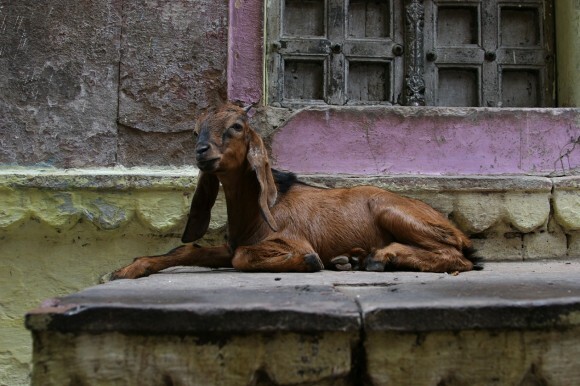 @ Rhonda: I’m happy to hear that the blog brought back memories of your own time in India. It sure is a crazy place! 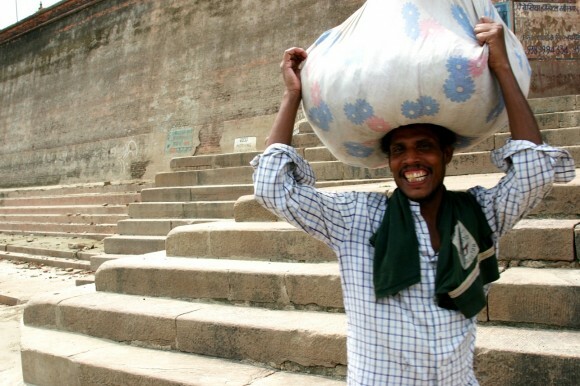 On a side note, I ended up on your page on bootsnall and wanted to say your Africa photos were amazing! 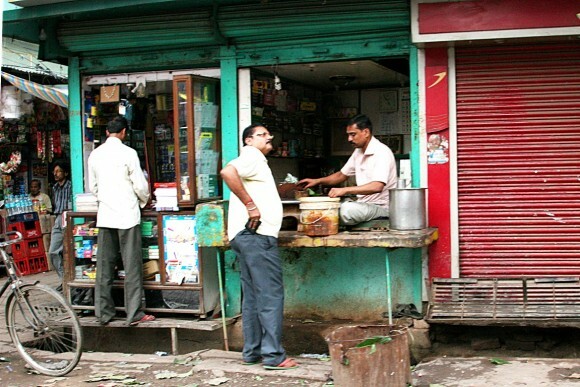 How would you compare the chaos of India to the African countries you traveled through? Hi Sheena! Thanks for the nice note on the African pictures. I must say, I don’t think ANYWHERE else compares to India! Africa has it’s own challenges, but in a very different way than India. There is nowhere near as much begging and corruption that affects the traveler as much (although, of course, the governments of Africa are incredibly corrupt) Travel is hard, roads bad (and LONG) and the comforts of home often hard to come by. It all makes up for and then some by the sights, which, truly are unlike anything you can find anywhere else. Nothing quite prepares you for spending months traveling through one immense wild animal park, except it’s not a park! The culture and music and great diversity of the tribes throughout the continent is fascinating. I will say, don’t except any great food for the most part. lol, India certainly wins out in that regard! Both so well worth the work but, except in a few places like Dar es Salaam, you won’t find anything like the chaos of ANY Indian city. 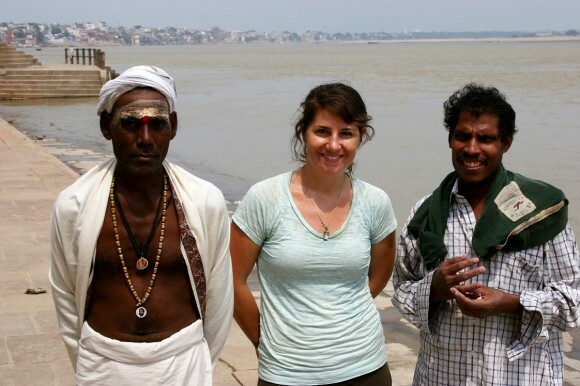 Hi and thanks for a nice story about Varanasi. Certainly this is a very strange placen. It is great to see such beauty again. Amazing how perspectives change after such a horrific month in India. 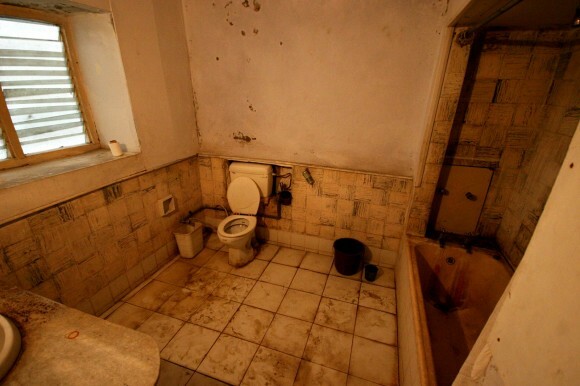 Yes, I can see how that bathroom would look like paradise after witnessing a month of stoop-and-poop on the street! Sheena, your descriptions were both moving and educational. It is amazing how devoted and spiritual these people are. Thank you! What an eerie and fascinating place. What a beautiful post. 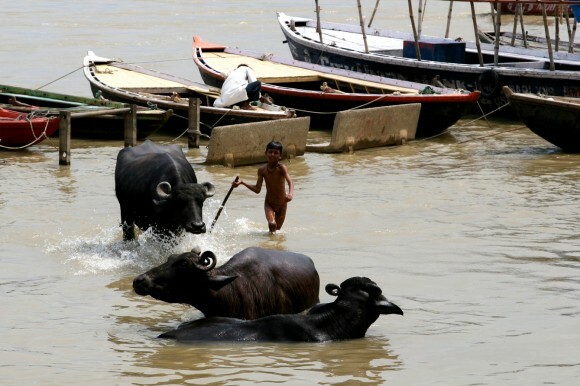 My five-year-old son was fascinated by the boy herding water buffaloes – Thank you for showing him a slice of life he’s never encountered before!